Just in the nick of time for xmas. 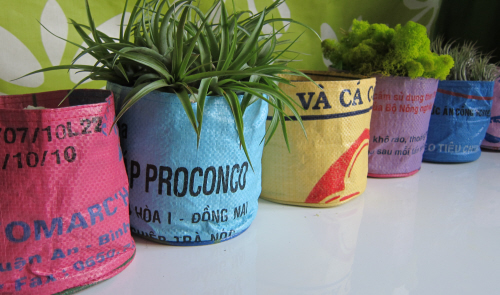 Finally Garden Beet has these colourful funky rice bag planters in stock. Made in Cambodia through a Fair Trade Scheme. Great for hiding ugly pots or holding buttons, pens or anything else that needs an ethical home. Garden Beet uses its pots to store reindeer moss, rocks and pebbles. We also use them as a vase for our air plants. All the ingrediants for one of our popular garden gifts – eco orbs. I was proudly annoucing this new product line to a freelance journalist Jay Martin. Being a journalist who has travelled extensively throughout South East Asia she quickly recognised the writing on the planters to be Vietnamese. The Cambodians source their fabric from Vietnam! Next articleA kick back lily pad approach to elevated picnics. By Jackie O’Shea.